Updated note: As of November 2018, Nvidia has announced they are stopping production of the Geforce 1080ti as well as the rest of the GTX lineup. Nvidia is now pushing gamers to purchase the RTX line instead. 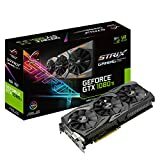 The 1080ti is becoming difficult to find, and many are selling the card now for an overpriced amount due to the low supply. If you are looking for the Geforce 1080ti in Canada you can still get it here for approximately $1,000. Get it quickly before quantity is all gone. The Geforce 1080ti is selling out fast, for high prices due to low stock and high demand. Nvidia announced they will stop making the card in November of 2018 (they have already stopped production, basically). The Geforce GTX 1080 Ti is one of the most powerful desktop graphics card on the market. Even when you compare the 1080 Ti against the new 2080 or 2080 Ti card, the 1080 Ti still measures up quite well. The card has 11 GB of RAM, operating at 11 Gbps. The number of outputs typically differ based on who the manufacturer is of the GPU card that you are purchasing. In cards where the DVI port has been removed, the card is usually cooler than it’s 1080 counterpart. This means that you get more power from the Ti variant in this situation. The 1080 Ti is VR Ready and supports 4k gaming. The performance of the 4k capability depends on a number of factors. Keep in mind that 4k means a huge number of pixels are being generated onto your monitor or computer screen. So the taxing effect on the display can be significant. How 4k works with your setup will depend on what game or application you decide you want to run. Some games operate better with 4k than others do. You may need to do a little bit of online research to understand what games operate more efficiently with 4k, and which ones do not. Some games will provide you with a higher framerate on 4k than others will. The Geforce GTX 1080 Ti was released in 2017 and is also a good selection if you wish to run multiple monitors as well, as it has multiple DVI ports. Powered by NVIDIA Pascal, the ASUS ROG STRIX GeForce GTX 1080TI is the world’s fastest gaming GPU, delivering jaw-dropping 5K HD gaming experiences with 11GB GDDR5X memory and 1632 MHz boost clock. Outshine the Competition with customizable Aura Sync RGB lighting while MaxContact and FanConnect II maximize cooling performance.